Este es el segundo evento del grupo, la anfitriona es Stacy de Food lust people love y el ingrediente son las uvas, de cualquier forma. Gracias Stacy :)! Calentaremos la mantequilla con la leche, hasta disolver, luego dejaremos templar, hasta que llegue a los 37º C nuevamente. En la batidora de pie, con el accesorio pala pondremos el agua templada, la levadura sobre la misma y a velocidad mínima agregaremos el azúcar y los huevos. Luego la mezcla de mantequilla y leche y la mitad de la harina, mezclamos por un minuto y pasamos al gancho amasador, agregamos la harina restante y amasamos por diez minutos. Si se nos sigue pegando mucho le ponemos un poco más de harina. La masa nos debe queda suave y elástica . La colocamos en un bowl aceitado y dejamos leudar por dos horas, dos horas y media hasta que duplique su tamaño. Yo en este paso la guardo en la nevera para hornearlo al día siguiente. Pasado este tiempo, desinflar, estirar y formar un rectángulo de 30 por 20 cm. Pintar con leche, espolvorear con azúcar y colocar las pasas de uvas. 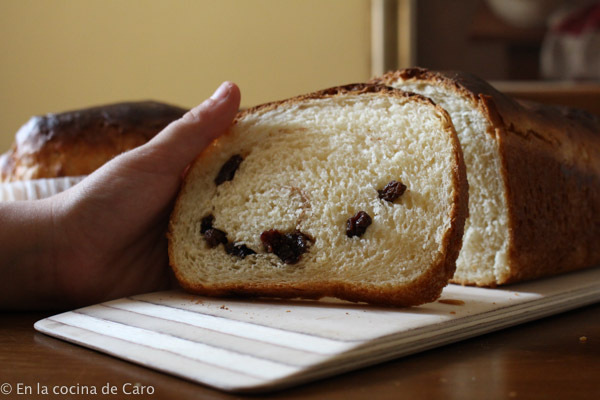 Enrollar y corar el cilindro por la mitad, de esa forma nos saldrán dos panes, que pondremos a leudar en un molde de 24 por 10 cm. Yo uso unos papeles de hornear desechables que se colocan dentro del molde y de esa forma no tengo que usar ni aceite ni harina. Dejaremos leudar, cubiertos por una hora y media aproximadamente. Precalentar el horno a 180ºC. 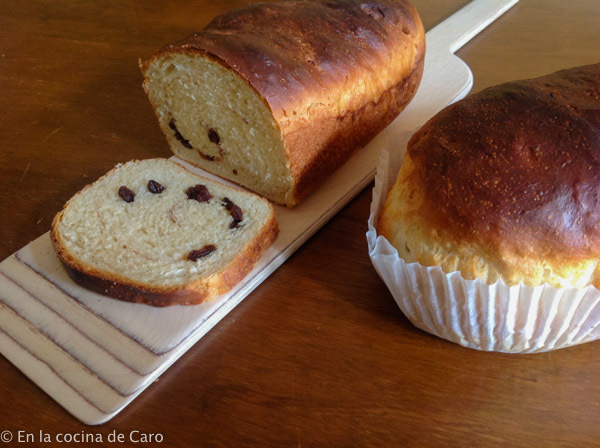 Pintar la superficie con leche y hornear por 35 minutos. Para saber si está listo podemos utilizar un termómetro instantáneo y ver que el interior esté a 85ºC u 87ºC. This is the second event of the group and it is hosted Stacy by Food lust people love she asked us to make any kind of bread with grapes, so I picked up raisins. Thanks Stacy :)! Heat milk and butter in a small saucepan, until butter melts, cool until warm about 110ºF. Pour warm water in the bowl of a stand mixer, fitted with the paddle attachment. Sprinkle yeast over the water. On low speed mix sugar and eggs. Add salt, milk mixture and 2 cup of flour. Mix on medium speed until blended, about 1 minute. Switch to the dough hook and add 1 1/4 cups more flour and knead at medium-low speed for 10 minutes or until dough is smooth and comes away from the sides of the bowl. Add flour sparingly if the dough sticks to the side of the bowl. Turn the dough onto a work surface. If the dough is sticky, knead up to a 1/2 cup more flour to form a smooth, elastic, soft dough. Transfer the dough to a lightly oiled bowl, cover and let rise until doubled in size, 2 to 2 1/2 hours. After the rise, punch down the center of the dough once. Making sure not to fold the dough, turn it onto an unfloured work surface; let dough rest 10 minutes. Grease the bottom and sides of a 9X5 inch loaf pan. In a small bowl, mix cinnamon and sugar together. Press the dough into an evenly shaped 6 x 8 inch rectangle. With the short end of the dough facing you, roll the dough with a rolling pin into a 18 X 8 inch rectangle. Brush dough liberally with milk. 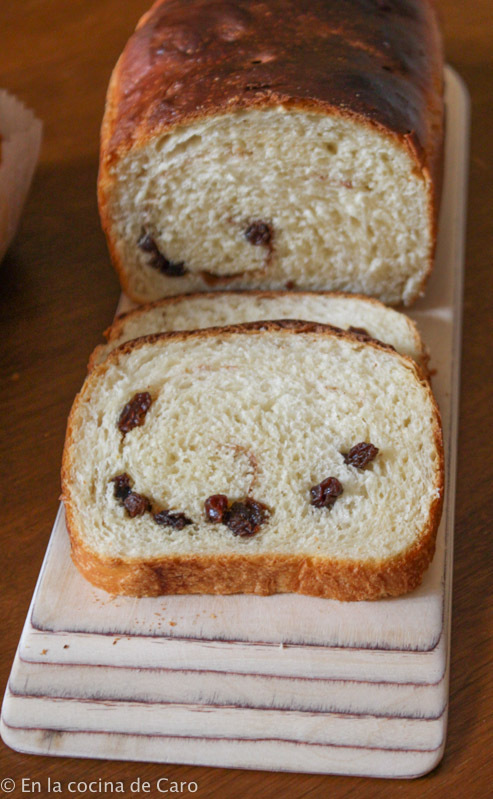 Sprinkle cinnamon mixture and raisins evenly over dough, leaving a 1/2 inch border on the far side. Starting at the side closest to you, roll up the dough, pinching the seam tightly to secure. Push the side of the roll in so the loaf is no bigger than 9 inches. With the seam facing up, push in the center of both ends. Firmly pinch the dough at either end together to seal the sides of the loaf. Place the loaf, seam side down, into prepared pan, press lightly to flatten. bread loaf fan, seam side facing down. Loosely cover the pan with plastic wrap and let rise 1 1/2 hours or until dough is 1 inch above the top of the pan. 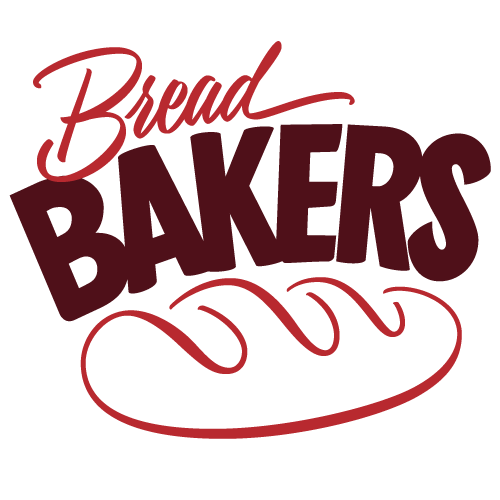 Bake until the bread is a golden brown, about 35-45 minutes and an instant-read thermometer inserted into the middle of the loaf reads 185 to 190°F. Remove from pan and let cool on its side on a wire rack until room temperature, about 45 minutes. Dulces de Brazil, Beijinho de coco. Galletas de maizena y leche condensada.